Last week I was lucky enough to attend the 15th Annual World Conference on Tobacco or Health in Abu Dhabi. With both Ireland and the UK announcing in the weeks leading up to the conference that they would implement plain (or ‘standardised’) packaging of cigarettes, it wasn’t surprising that this was one of the conference’s hot topics. One of the sessions that focused on plain packaging was organised by Professor Melanie Wakefield’s team at the Cancer Council Victoria in Australia. As the first country in the world to introduce plain packaging, Australian data on its real-world effectiveness is of keen interest to policy-makers worldwide. 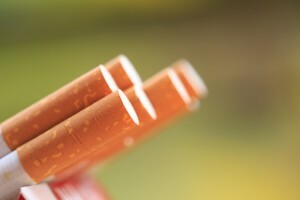 These researchers published a supplement to the journal Tobacco Control last week, including 12 new studies on plain packaging in Australia (more details about each of the 12 studies and their methodologies are given at the end of this blog). The majority of these used a ‘pre-post’ methodology, which means that they assessed behaviours and attitudes to smoking before plain packaging was introduced and compared with these same attitudes and behaviours afterwards. At their conference session, some of these studies were discussed in more detail, with one in particular (Durkin et al., 2015), which investigated the impact of plain packaging on quitting-related cognitions, catching my attention. This study seemed like the logical extension of my most recently published paper on plain packaging, which reports the results of randomising UK smokers to use either a branded or a plain pack of cigarettes for a day and measuring smoking behaviour and attitudes to smoking and quitting. As I’ll discuss later on, it’s important that we use a range of methodologies, including laboratory based experiments (such as those I’ve conducted) and real-world investigations (such as those conducted by the Australian researchers) to investigate the possible impact of plain packaging. Data for this study were obtained as part of a continuous cross-sectional telephone based survey. Participants were called twice, one month apart, first for a baseline survey and then for a follow-up. Participants were aged between 18 and 69 and all participants were required to be cigarette smokers at the baseline call. At both the baseline and follow-up stages, participants were asked about quitting related cognitions, micro-indicators of concern and quit attempts. Logistic regression was used to analyse the data and participants’ baseline scores were included as predictors for their follow-up scores (after accounting for potential confounders). Essentially, this means that follow-up scores between participants in the four groups could be directly compared, accounting for any differences at baseline. Responses from participants in Groups 2, 3 and 4 were compared with those of the participants in Group 1. This study provides modest statistical evidence that plain packaging in Australia has increased micro-indicators of concern, increased quit attempts and increased some quitting related cognitions among smokers. It is possible that more substantial changes in the downstream effects such as those measured in this study may take longer to emerge. Investigating the impact of plain packaging in the ‘real-world’ using this pre-post technique has its limitations. Unlike the laboratory, the real-world isn’t tightly controlled and although the researchers tried to account for other factors which may have influenced the results, such as changes in the price of tobacco and other tobacco control measures such as mass media campaigns, it’s impossible to completely control for the effect of these, making causal interpretations difficult. Obviously we cannot randomise whole countries to either introduce or not introduce plain packaging (which would address these limitations), and examine what happens to smoking prevalence in these countries. Studies like that by Durkin and colleagues are therefore probably the best that we can do in the real world. Moreover, no one piece of research will give us the full picture when it comes to the potential impact of plain packaging. 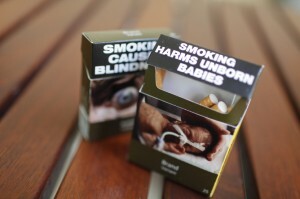 Although, on their own, these findings do not provide overwhelming support for a beneficial impact of plain packaging, when they are considered together with the other studies in theTobacco Control supplement, and with data from the Australian government (which this year reported record lows in tobacco sales and smoking prevalence) along with findings fromlaboratory-based experiments and surveys, the evidence looks more compelling. Now that both the UK and Ireland have announced plans to introduce plain packaging in May 2016, with other countries likely to follow suit, it will be important to continue to monitor the longer-term impacts of this tobacco control measure, making use of the wide range of research tools and methodologies available to us.